Roller Derby’s Lite Up Laces have been pretty popular. They’re currently in 36” and 45” lengths, but they’re adding a 72” soon. They’re also going to start offering all sizes in pink. Pink, light pink, purple, light blue, lilac, white with white trim, white with purple trim, white with blue trim, white with black trim, olive, black, navy, lime green, mint (new), coral (new), blue, green, yellow, chocolate, orange, maroon, teal, hexagon, polka dot, tie dye, posey, camo, zebra with lime, zebra with black, zebra with red, all zebra, and zebra with pink. Sure-Grip is showing two new skates. The Cyclone is a speed skate that will be coming in several bright colors that they’re promoting as “The Best $99 Retail Skate In America”. The GT-50 Plus is similar in quality to the GT-50 skate, but the sole of the skate has LED lights built into it. Each skate has several different color options that you select by pressing a button inside the shoe. It recharges with a USB cord. The Cyclone has a tentative ETA of late October. The GT-50 Plus is going to be later, hopefully in December. We’ll have much more on both of these as soon as details are available. Roller Derby’s Stomp Factor 5 skates are another speed skate option with bright colored boots. These are available now. They look great all the time, but especially under black lights. Roller Derby is also working on a light up skate with an LED light built on the underside of the sole. We’ll have more details on this one as soon as they’re ready. Vanilla’s newest version of the Junior skate is called the Code Red. 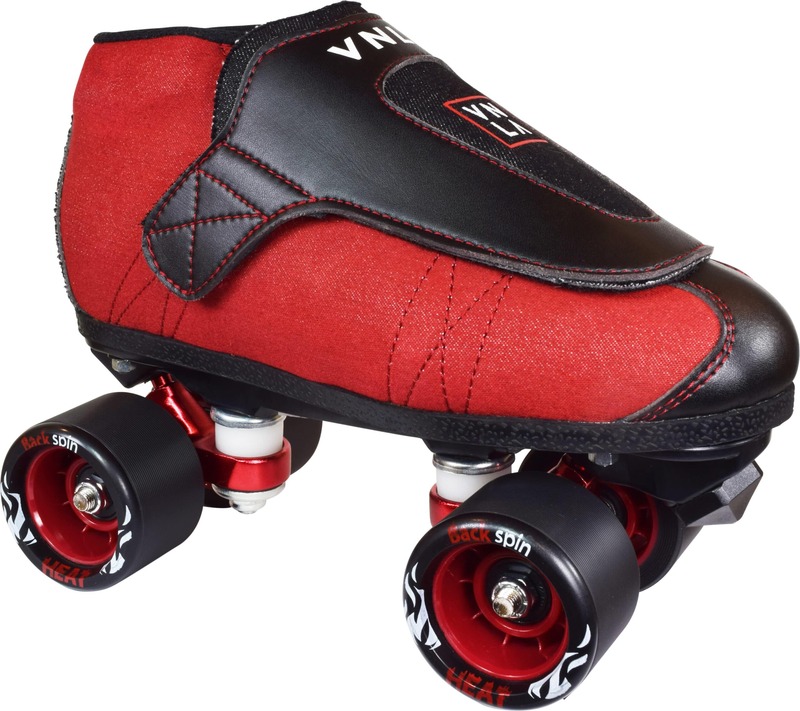 It is pretty similar to the Denim skate, except instead of the traditional blue color of denim it is red. They are unloading the boxes right now, all sizes are in stock. So if you’re coming to the tradeshow, take a pair home with you.